Take I-35 North to I-10 West and continue to Huebner Road. Take exit 560 to Huebner Road. Continue to the intersection, then turn left onto Huebner Road under the overpass. Continue to Huebner Road approximately 1.5 miles to 9627 Huebner Road.American Dynamic Imaging is located on the right hand side at the Huebner Professional Center. Take I-410 West to I-10 West. Take exit 560 to Huebner Road. Continue to the intersection, then turn left onto Huebner Road under the overpass. Continue to Huebner Road approximately 1.5 miles to 9627 Huebner Road. 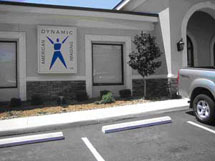 American Dynamic Imaging is located on the right hand side at the Huebner Professional Center. Take I-35 South to TX-1604 Loop West and continue for 16 miles. Merge onto I-10 East. Take exit 560A to Huebner Road. Continue to the intersection, then turn right onto Huebner Road. Continue to Huebner Road approximately 1.5 miles to 9627 Huenber Road. American Dynamic Imaging is located on the right hand side at the Huebner Professional Center. Patients can drive right up to the door - our ample parking lot allows for easy access for those with special needs. For patients with mobility issues, we provide door-to-door service. Contact us for more information.